• The Froelick Gallery, 714 N.W. Davis St., presents Matthew Dennisons' "Democracy" through June 2. The show examines his ecological and political concerns, depicting oblivious humans in the company of wise-looking animals, placeless urban scenes, and threatened natural places. Part of the exhibit is from 365 small paintings for vintage book covers that he created in 2017, each day reflecting the news cycle. Also showing is "Rick Bartow: Things You Know But Can't Explain," a touring retrospective (which opens May 14 and closes Feb. 15, 2020) and Barry Pelzner's "(Ir)regular" through June 2. For more: www.froelick.com. 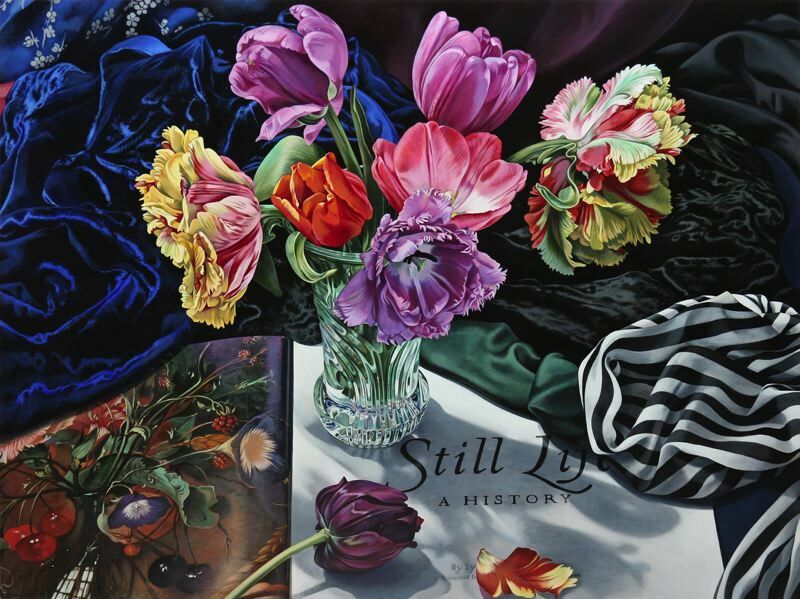 • Sherrie Wolf's "Juxtapositions" revisits themes of bountiful floral and fruit arrangements, museum postcards and art history books. Margot Voorhies Thompson's "Oregon Outbooks" features works of abstracted landscapes made of actual earth, using pigments, crushed rocks, minerals and charcoal from burned forests. They show at Russo Lee Gallery, 805 N.W. 21st Ave., through May 30, starting at 5 p.m. First Thursday. For more: www.russoleegallery.com. • The Crafty Wonderland Spring Art and Craft Market will take place 11 a.m.-6 p.m. Saturday, May 5, at the Oregon Convention Center, 777 N.E. Martin Luther King Jr. Blvd. For more: www.oregoncc.org. • As featured in a story on late artist Jimmy Mirikitani at portlandtribune.com, "The Art of Mirikitani" will show at the Emerson Street House, 1006 N.E. Emerson St., May 2-Sept. 16. Gallery hours are 1-4 p.m. Wednesdays-Sundays. An official opening is 4 p.m. Sunday, May 6. The documentary on Mirikitani, "The Cats of Mirikitani," will be screened at the Clinton Street Theater, 2522 S.E. Clinton St., 7 p.m. Thursday, May 10, and June 29. • Programmed by Native Arts & Culture Foundation, seven Native American artists share their perspectives through art at The Old Church, 1422 S.W. 11th Ave., 7 p.m. Tuesday, May 8. For more: theoldchurch.org. • With "Shokunin: Five Kyoto Artisans Look to the Future," May 12-July 8, Portland Japanese Garden, 611 S.W. Kingston Ave., presents artists who carry on traditional art forms with tools, techniques, materials and spirit. For more: www.japanesegarden.org. • Reminders: The Portland Art Museum, 1219 S.W. Park Ave., offers free admission from 5-8 p.m. on First Thursday, www.portlandartmuseum.org. ; Portland Children's Museum, 4015 S.W. Canyon Road, offers a free First Friday, 4-8 p.m., www.portlandcm.org.